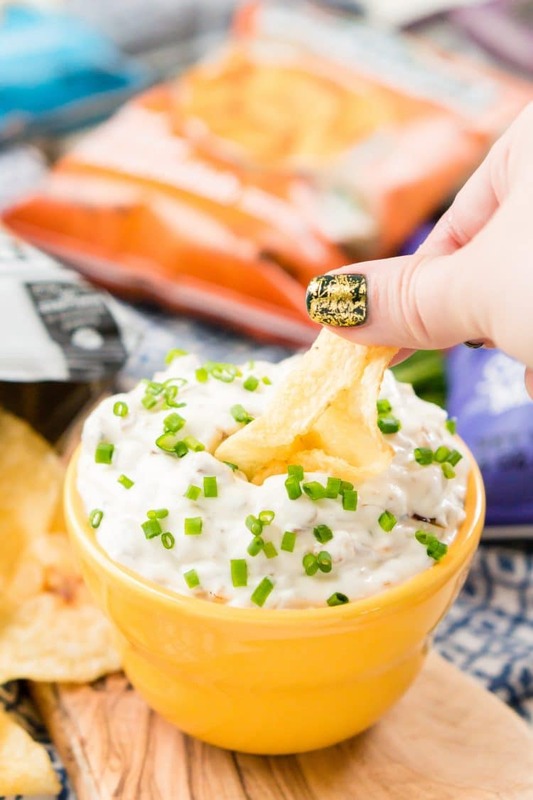 This French Onion Dip is a sponsored post written by me on behalf of Deep River Snacks. All opinions are 100% mine. This French Onion Dip is an easy and delicious appetizer recipe, serve it with chips for an instant party favorite! As we head into the holiday season, one thing is for sure, there will be lots of chips and dip! 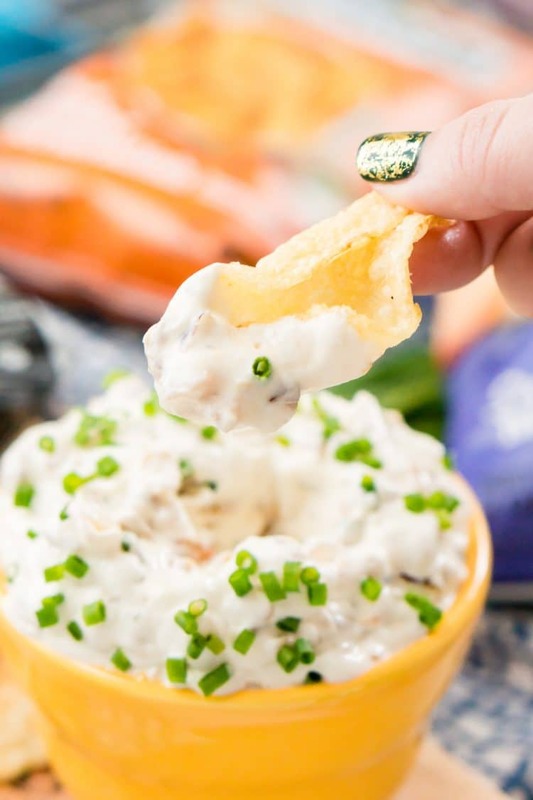 I mean, it’s pretty much a staple at every party and in my opinion, French Onion Dip is the best of ’em! But it’s gotta be homemade, it’s just gotta be! 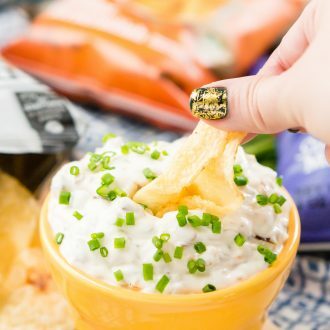 Make sure to serve this French Onion Dip up with some delicious Deep River Snacks kettle chips, they add the perfect crunch to go with that creamy and delicious dip! 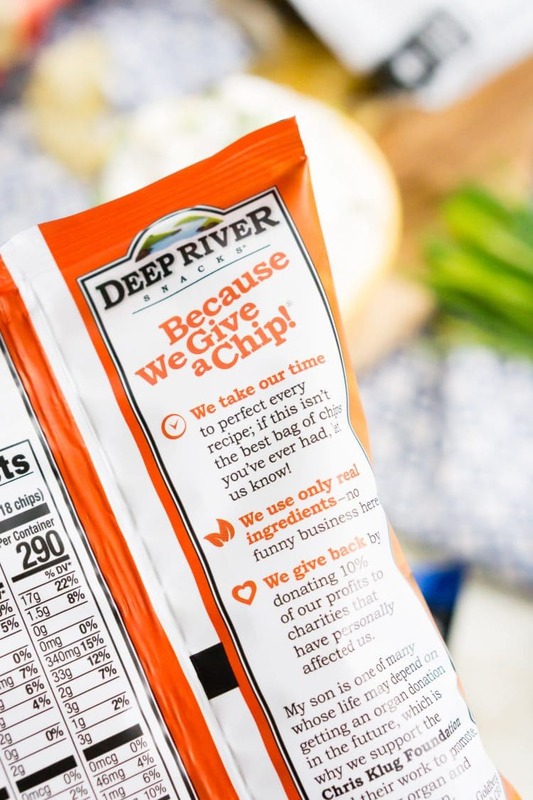 Deep River Snacks is based out of Connecticut and just like most New Englander’s they believe in quality and community. I love teaming up with companies I believe in, especially when they’re making a positive impact for the people and communities they’re a part of. Deep River Snacks sent me boxes upon boxes of chips which I’ll be donating to my in-law’s classroom for children who need snacks during the school day. Their mission is to craft the world’s best tasting chips using simple, non-GMO ingredients, and using their brand as a platform to give back to those in need. They literally “Give a chip!” They give 10% of all net profits to charity each year, and better yet, those charity partners have personally impacted the lives of their employees. 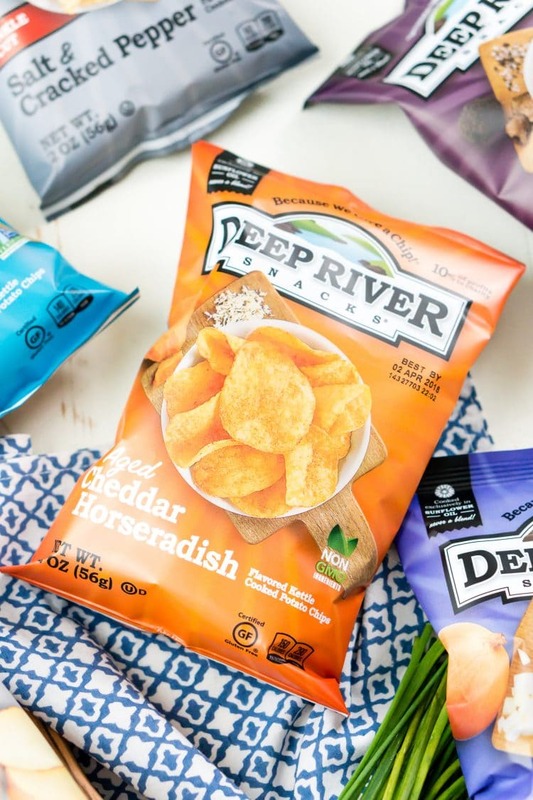 Deep River Snacks has tons of flavors to choose from that are made with simpler, better ingredients, my favorites being the Sweet Maui Onion and the Sea Salt & Vinegar. However, I highly recommend pairing this French Onion Dip with their Sea Salt or NEW Black Truffle chips. Grab the coupon offer and stock up on Deep River Snacks today! So as you enjoy the holidays and parties with friends and family, don’t forget how important it is to give back this time of year and all year long. Find an organization you believe in or that has impacted your life and “give a chip” about it! Heat the oil in a large skillet over medium heat; add the onions, minced garlic, and 1/2 teaspoon of salt. Cook and stir until the onions are caramelized to a nice golden brown, about 30 minutes. Remove the onions from the heat and cool. Mix together the sour cream, mayonnaise, Worcestershire sauce, garlic powder, pepper, and remaining salt. Stir in the onions when they are cool. Cover and refrigerate the dip for at least 2 hours before serving. Serve with Deep River Snacks kettle chips. This sounds like a really tasty dip, the kind that always gets finished off. Perfect for any buffet table or party platter, with raw veggies, bread sticks or crisps. The Deep River snacks you mention sound fab, and the giving to charity is a great bonus. Good chips definitely make a difference with chips, these from Deep River sound good. Mmm this looks delicious! I love the idea of making french onion soup in dip form- how cheesy and decadent! !